In honor of Veterans Day, Jim Grice, veteran and EYE-Q patient, agreed to share his story with us. Jim is a big fan of the doctors and staff at EYE-Q, and was eager to recount his experiences. EYE-Q is privileged to honor and serve the veterans that live in the Central Valley. This Veterans Day, we would like to say “thank you” to everyone who has served and is serving in our military. We would like to invite veterans to sign the wooden flag that hangs in the lobby of our Fresno location so that we may honor you continuously. You are a treasured part of our community, and today and every day, we are indebted to you. We are more grateful than you could possibly know. 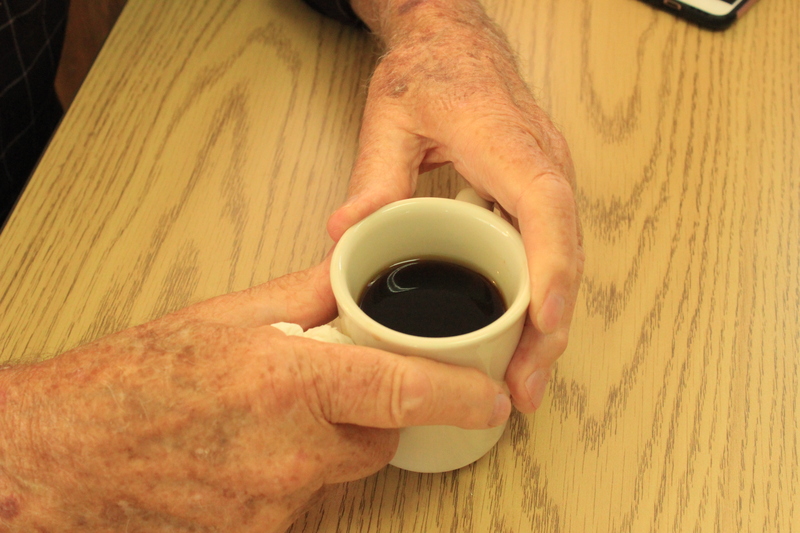 Jim Grice enjoys his morning cup of coffee. It seems like everyone knows Jim Grice. Maybe it’s because he lives in Selma, with a population of less than 25,000 people; or maybe he just frequents the places where he is already well-known. Regardless, it is clear that those who know Jim love him dearly. While he may seem like an unlikely socialite, he can never resist the urge to strike up a conversation with whoever is sitting closest to him. In this way, Jim has gathered many friends in his lifetime. Jim is a U.S. Army veteran. His deployment during the Korean War lasted for sixteen months; maybe the longest sixteen months of his life. He was responsible for heavy artillery, which has caused many hearing issues. Nearly everything the soldiers ate came out of a can (Jim said he would have done just about anything for a big glass of milk and some cereal). In the cold of winter, they lived in caves, layering every item of clothing in their possession to stay warm at night. Jim recently returned from his Honor Flight trip, which went to Washington, D.C. The goal of Honor Flight is to give veterans honor and closure. Jim knew some of the veterans from the area already, but met many new people on his trip, too. He didn’t miss any opportunity to chat and make friends, as usual. Jim loved the monuments, but said you couldn’t really do much beyond looking at them and taking pictures (his son, who accompanied him on the trip, took many, he said). However, at the Smithsonian Air & Space Museum, he was blown away. “I got to really focus on the exhibits, and there were a ton of ‘em,” he said. As a lifelong mechanic, the museum was his favorite part of the whole trip. 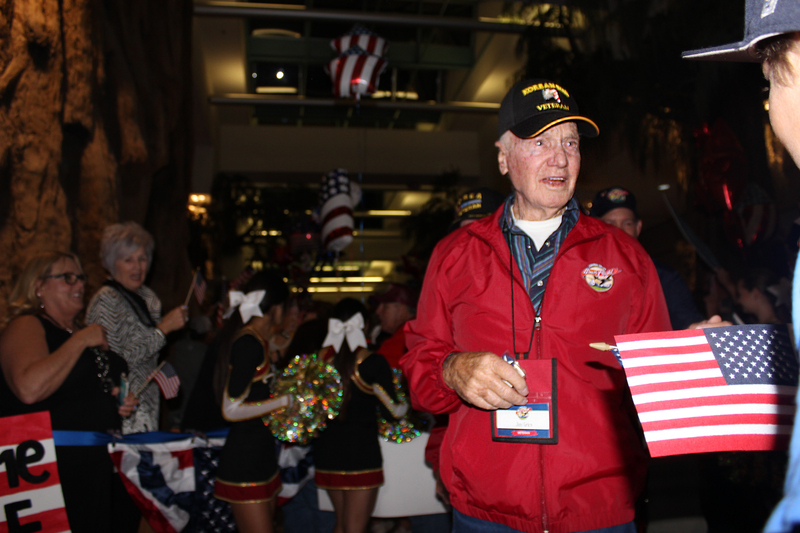 Jim exiting the Honor Flight at the Fresno Airport homecoming. The Central Valley Honor Flight returned on October 26th, and veterans on the flight were greeted with hundreds of people: family, friends, students, military members, EYE-Q employees and grateful onlookers; all hoping to thank and shake the hands of people who sacrificed so much to protect our country. Jim spoke highly of the trip as a whole, saying that the coordinators were amazing because 170 people stayed completely on schedule the whole time and no one was left behind. He’s travelled all over the world since his days in the military, but he says he’s never liked anywhere as much as he likes being here. At McCoy’s Coffee Shop in Selma, Jim begs waitresses to sit down with him while he finishes his coffee. His favorite joke is to ask people if they’ve got any money. You should see the grins he gets. “You got a couple bucks for this?” he’ll say with a wry smile, pointing at his lunch. Whoever he’s asking will give some variation of, “No, Jim,” and he’ll say, “Well, how am I supposed to pay for this?” Everyone who knows him knows the script, and they always laugh. After the war, Jim worked as a mechanic on big trucks. 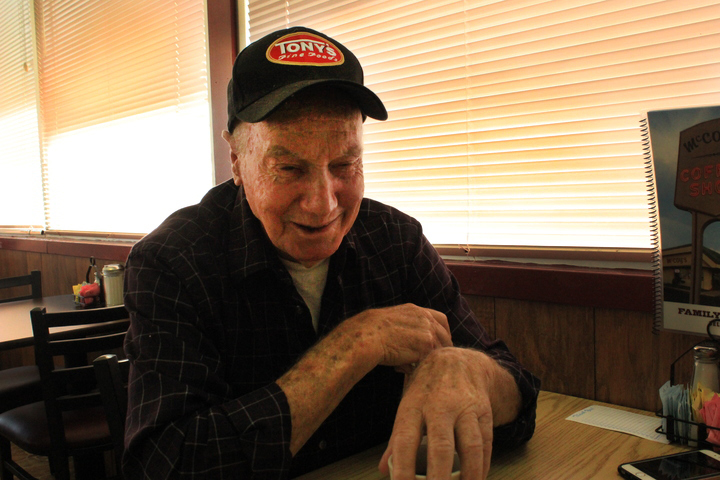 He first worked for a trucking company for 28 years, then at Poindexter Nut Company until his retirement (about 8 years, in total), fixing their trucks and large machinery. In that time, Jim charmed everyone he met. He visits “the nut house” regularly, and he’s a celebrity there. He hasn’t worked there in years, but still stops by to see all of his favorite people and pick up bags of nuts for the doctors and staff at EYE-Q. One woman in particular popped out of her desk chair the minute Jim walked into the office, eager to give him a hug and ask him about his trip to D.C. When a coworker asked how long she had known him, perhaps expecting to hear about the days before Jim retired, she paused. EYE-Q supports Honor Flight in hopes that veterans from all over the country will be able to be honored for their service. You can donate to Honor Flight by clicking here. Sign-up to receive additional information today.